Elizabeth G. “Bette” Cox grew up in Florence, South Carolina, in the heart of the Pee Dee region of South Carolina. She attended the University of South Carolina at Florence, now Francis Marion University. In 2006 she completed the coursework from UCLA-Davis and received a Certificate as Oral Historian. She has two children, two grandsons, one great-grandson and one great-granddaughter. A Bible student and teacher for over thirty years, speaking, teaching, and writing many articles and Bible study guides, Bette’s special interests are healing and the Gifts of the Holy Spirit. She formerly wrote and published a devotional print newsletter, Esther’s Petition. Click the Home Page link to read the current issue, now on-line as one of her blogs. A natural outgrowth of Bette’s interest in genealogical research, the Family Memories Division of her company assisted a number of families to preserve their life stories, from full length biographies to special occasion memory books. 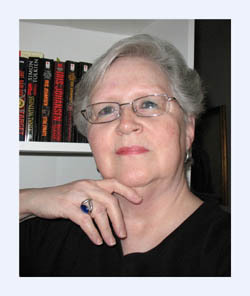 An avid reader as well as writer, Bette has authored several family biographical articles, several humorous short stories, one full-length mystery novel and one online humorous serial mystery novel. She also writes several blogs. Click on the links on the Home Page to read some of these. Bette has been an active worker for conservative and Christian causes for many years. See http://www.BetteCox.com for more information about Bette’s interests and activities. You can also find her on Facebook and Twitter.